Special guest Paul Winter will play. Paul will be presented with the Thomas Berry Award at the annual meeting, in honor of his years of dedication to the Great Work and the flourishing of the Earth Community. We will celebrate the 10th anniversary year of Thomas Berry’s passing with the publication of a new book from Columbia University Press: Thomas Berry: A Biography, by Mary Evelyn Tucker, John Grim, and Andrew Angyal. "Teilhard’s Mysticism: Spiraling into the Cosmic Christ"
"The Recovery of Wisdom: Art Exhibition at Clare Gallery"
February 3, 1:00 - 3:00 pm: a free screening of the Emmy award-winning film Journey of the Universe. This stunning HD film is an epic journey connecting the cosmos, the earth, and human transformation. February 17, 1:00 - 3:00 pm: a panel discussion with John Grim and Mary Coelho. "Teilhard de Chardin: A Spirituality for Those Who Love the World"
"Facing the war – Looking beyond"
This event is part of “Uniting Our Jesuit Frontiers: To Know God, To Love God, To Serve God,” the congress of the World Union of Jesuit Alumni (WUJA). "Ecology, Science and Spirituality - Friends or Enemies? Building on the legacy of Pierre Teilhard de Chardin and Alister Hardy"
This event celebrated 30 years of John’s tenure as President of the American Teilhard Association. We also celebrated the 50th anniversary of the ATA. A brand new opera from renowned Norwegian composer Gisle Kverndokk and librettist Aksel-Otto Bull based on the writings of Father Pierre Teilhard de Chardin and in honor of "Laudato Si," Pope Francis' recent encyclical about the environment. Use the code OPERA50 when ordering to get 50% off any seat. This discount is good for advance orders only, and will not be honored at the door. "The Theology of Evolution—Convergent, Contingent or Directed?" Sponsored by The British Teilhard Association. "Evolution and the Anthropocene: Science, Religion, and the Human Future"
"Teilhard de Chardin and World Religions: Ultra Catholic or Ultra Human?" "Following the ‘Road of Fire’: The Emergence of Teilhard de Chardin’s Panchristic Mysticism during the First World War"
Pierre Teilhard de Chardin realized the heart of God pulsates in all creation. Using Teilhard’s vision, participants will be energized to respect the presence of the Spirit in the diversity of creation, other people, and to work for justice and peace in our modern world. "Teilhard, Religion, and Big History: A Look Inside"
View photos from this meeting. Talks by Henry de Lumley, Marie Bayon de La Tour, François Euvé s.j., Marie-Jeanne Coutagne and Henri Madelin s.j. For additional information, please contact Samuel Wagner at Samuel.Wagner@georgetown.edu or 202-687-4005. Following the mass, talks will be given by Marie Bayon de La Tour, Marie-Jeanne Coutagne and François Euvé s.j. "Pursuing the Truth: Teilhard de Chardin and the Benedictine Tradition"
This lecture is part of the 125th Anniversary Celebration of Saint Anselm College. "Renewing the Face of the Earth: The Insights of Teilhard de Chardin on the Eucharist, Compassion and Suffering"
"Christianity and Evolution: The Vision of Fr. Pierre Teihard de Chardin, S.J." "Teilhard’s Thought: Growing the Tradition Forward"
For any tradition to have a vibrant future, it needs to keep on growing in dialogue with historical and cultural changes. This lecture will explore areas where such development could serve to open Teilhard’s thought and vision to more robust use by 21st century theology. 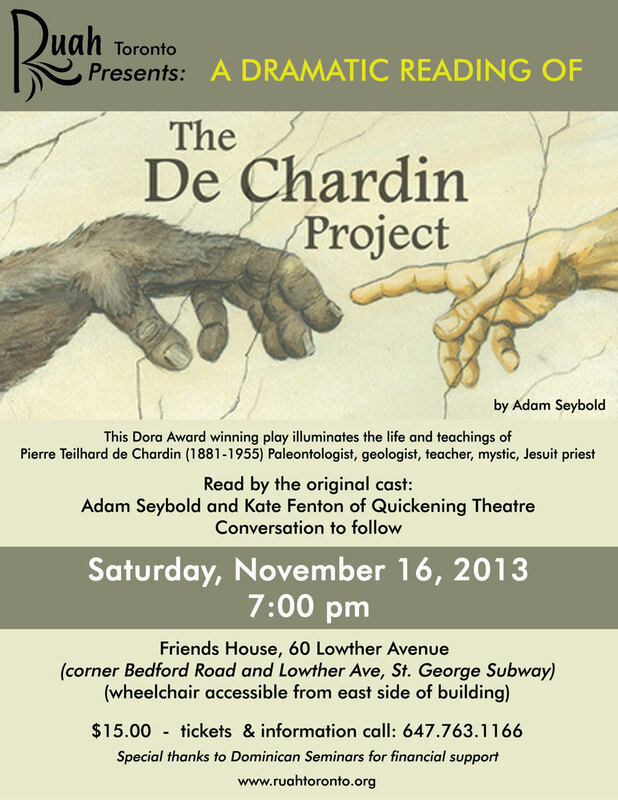 "A Dramatic Reading of The De Chardin Project"
Read by Adam Seybold and Kate Fenton of The Quickening Theatre Co.
"The Ecological Spirituality of Teilhard de Chardin"
the European Teilhard de Chardin Committee C.E.T. Journey of the Universe is an epic story of cosmic, Earth, and human evolution inspired by the thought of Teilhard de Chardin. This dramatic film reimagines the universe story and reframes the human connection to the cosmos, as did Teilhard. Journey was written by Brian Thomas Swimme and Mary Evelyn Tucker, the vice-presidents of the American Teilhard Association. In addition to the film, the Journey project includes a book published by Yale University Press, an educational DVD series of interviews, and an online curriculum. All are available for purchase. In April of 2005 the American Teilhard Association, in collaboration with the French and British Teilhard Associations and other partnering institutions, begins a yearlong commemoration of the 50th anniversary of the death of Pierre Teilhard de Chardin (1881-1955) in New York City. One of the leading thinkers of the 20th century, Teilhard integrated his scientific understanding of evolution with his religious understanding of the "divine milieu." His vision of the human as part of a dynamic unfolding universe is expressed in his classic text, The Human Phenomenon. As an accomplished scientist and as a person of deep religious conviction, Teilhard was himself a pioneer in bridging religion and science. He was as well a visionary capable of imagining a viable and vibrant human future. In advance of his time and in the midst of great turmoil Teilhard perceived an emerging global consciousness. This was consistent with his understanding of evolution that would unify the human spirit despite the disruptions of war and conflict evident in the first half of the 20th century. Though exiled from his native homeland and refused permission to publish The Human Phenomenon during his lifetime, Teilhard did not lose his humility or his zest for life. Teilhard's life and thought provide a remarkable reflection on endurance that arises from meaningful work, a productive life, and an ever-deepening spiritual vision of reality. In addition to his multi-volume scientific work on paleontology completed during his lifetime, Teilhard's religious writings were eventually published after his death in 1955. With his idea of human consciousness encircling the planet as the noosphere, Teilhard is also credited with anticipating the complex technological connection of human thought now evident in global communications and in the worldwide Internet. Moreover, his thinking regarding the unity of the human has influenced several key founders of the United Nations.